I was nearly four months into my stint in the communications office at the California Nurses Association, or CNA, when I found myself in a half-lit, mildewed, second-floor conference room in the union’s downtown Oakland office, seated among a clutch of maybe seven or eight other communications staffers, all white with the exception of myself and an Asian woman. The task this late April afternoon was to identify “nurses’ values,” which I had assumed meant that I would help pore over the results of a nurses’ questionnaire to produce a coherent ad campaign. Instead, the communications manager, Sarah Cecile, stood astride an easel that leaned like a sprinter at the finish line, her magic marker poised to add to the wan list of nouns that glared accusingly at me, reducing Hegelian dialectical inquiry to a game of charades. “Maybe they know something I don’t,” I said sarcastically, “but if we’re telling the rank and file what to do, doesn’t that make the union just another boss that the nurses have to answer to? Should communications organize a coup of sorts?” I asked provocatively. When I returned to my office 30 minutes later, I had an email from the CNA’s executive director, RoseAnn DeMoro, summoning me to a meeting the following morning. Dubbed the nation’s most progressive labor union by The Nation magazine and many others, the CNA — and its umbrella organization, National Nurses United — may, in fact, be exactly that; everything is relative. But it also provides a case study in how organized labor — the engine for creating the most prosperous working class in the known world — finds itself at death’s door at the exact moment when American workers are in dire need of advocates. Central to this narrative is DeMoro, who announced her retirement in a March 6th tweet and will be leaving the post she has held for 32 years. While she is feted and fawned over by white liberal journalists such as Amy Goodman, Paul Jay, and Bill Moyers, rank-and-file nurses of color and community activists often describe her and the NNU as either loathsome or missing-in-action when it comes to the issues that are important to them. 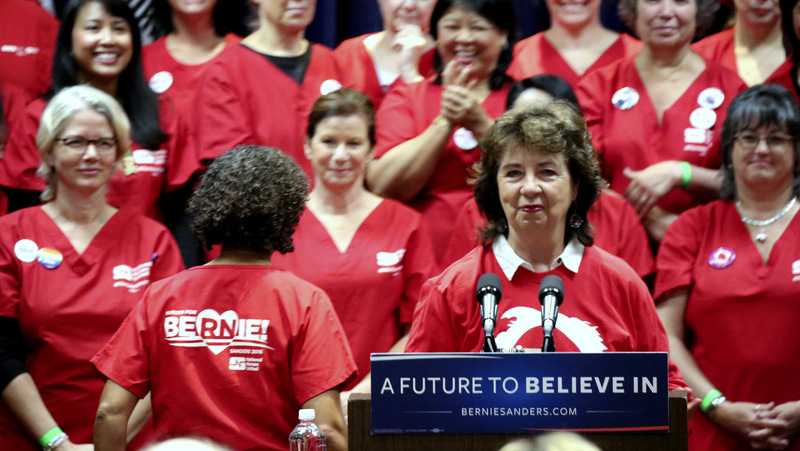 “Everybody knows that RoseAnn loves her white boys,” one Latina union rep told me in 2015 — days after DeMoro had completely ignored her when she suggested at a staff meeting that the nurses’ union should coalesce with California’s vibrant immigrants’ rights movement. Had she suggested that NNU join forces with, say, Mark Zuckerberg or Elon Musk, the labor rep said, DeMoro would have been positively giddy at the prospect. Later, a black nurse would tell me that she and other black nurses were discussing forming a collective for black nurses in the state because DeMoro and her mostly white executive staff were unresponsive to their needs and ideas, such as championing the Black Lives Matter movement as a public health issue. But perhaps no single incident is more damning of DeMoro’s leadership than the 2015 sale of a network of indigent hospitals, which included San Jose’s O’Connor Hospital, managed for more than a century by the Catholic order Daughters of Charity. The CNA endorsed a proposal by Daughters of Charity executives to sell the chain to Prime, a southern California-based healthcare provider with a reputation for ripping off Medicaid, its patients, and its workforce. A 2014 federal audit of Prime hospitals, for instance, found 217 cases of improperly diagnosed kwashiorkor, a form of malnutrition that is seldom seen in the U.S., and typically found only in the global South. Unsurprisingly, Medicaid reimbursement rate for the disease is quite high when compared with other maladies. The Service Employees International Union (SEIU), on the other hand, favored a sale to a Wall Street hedge fund called Blue Wolf with no management experience in the healthcare industry, but a demonstrated proficiency for dismantling businesses and auctioning their parts off to the highest bidders. The thing of it is, the working class communities of San Jose — a Benetton-blend of Latinos, South Asians, Blacks and Whites — wanted Santa Clara County to buy O’Connor Hospital, and it wanted Prime least of all. Had they bothered to show up for any of the dozen or so community stakeholder meetings held in 2014, the CNA’s leadership might have known this. But Bob Brownstein, the executive director of the civic organization Working Partners USA, could remember seeing a CNA labor representative at just a single meeting — and if he chimed in on the discussion, Brownstein couldn’t recall. Labor representatives for the SEIU, on the other hand, and Blue Wolf executives were fixtures at the stakeholders’ meetings. I don’t think either union [CNA or SEIU] did much of anything, but SEIU was clearly more comfortable in dealing with the community. As I recall, there was someone from Blue Wolf and the SEIU at every meeting and they answered every question that everyone put to them. They were clearly trying to generate answers and they even made some changes to the original proposal [to win the community’s approval]. So much so that a coalition of 15 civic groups wrote a joint letter to California’s then-Attorney General Kamala Harris urging her to veto the sale to Prime. The stakeholders’ clear preference was Santa Clara County which had bid on O’Connor, and whose health care network had a regional reputation for providing quality care to the uninsured that was second only to O’Connor’s. The hospitals were ultimately sold to a Wall Street investment firm, which began to dismantle O’Connor almost immediately, in an effort to eliminate all-but the most profitable units. By January of 2015, Brownstein, Melanio and others knew that shifting the conversation from the two labor-backed bidders to the county’s bid was a longshot, at best. Organized labor in the U.S. managed to create the American middle-class by plugging into communities like east San Jose’s, and using its political — and even physical — muscle to extend social democracy. It helped build affordable housing, elect city council members to champion government child care and transportation subsidies, and it backed progressive political candidates like Harold Washington, Chicago’s first black mayor. But — beginning with passage of the 1947 Taft-Hartley Act, which compelled labor leaders to chase out their most progressive members under the pretext of communism, and accelerating when Wall Street wooed New York City’s white ethnic labor leaders to support the financers’ 1975 takeover of the city’s budget — organized labor defected from the workers’ movement it had once made formidable. DeMoro was heir to that legacy. She began by asking me if I had any ideas for trying to improve the union’s communications effort, which was odd, since she’d blown off an email with my suggestions for doing exactly that only weeks earlier. With that awkward smile on her face, she made it clear that she shared my faith in neither the rank-and-file nor the community. Far from the adversarial approach adopted by the Congress for Industrial Organizations during the New Deal, she clearly saw organized labor as part of a tripartite alliance with the Democrats and big business. DeMoro’s annual salary at the time was $359,000, more than triple the average nurse’s yearly pay. A week later, she fired me, ironically enough on May Day; I did not seem happy there, I was told through one of her subordinates.